Let’s go to the space museum. 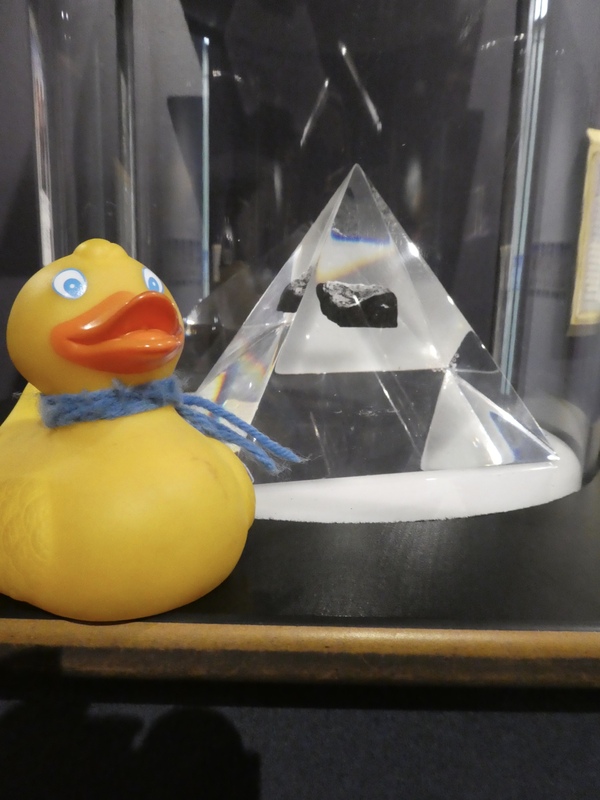 We ducks are interested in many things, with aviation and space travel near the top. 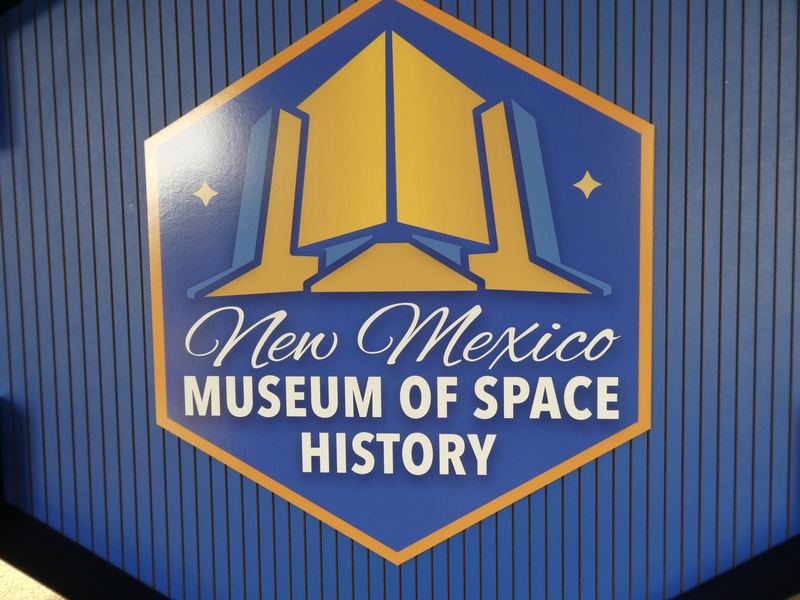 Today we are visiting the New Mexico Museum of Space History in Alamogordo, New Mexico. Before we even enter the building, we see many exhibits outside. This is a German Air Force Tornado 45 + 11. 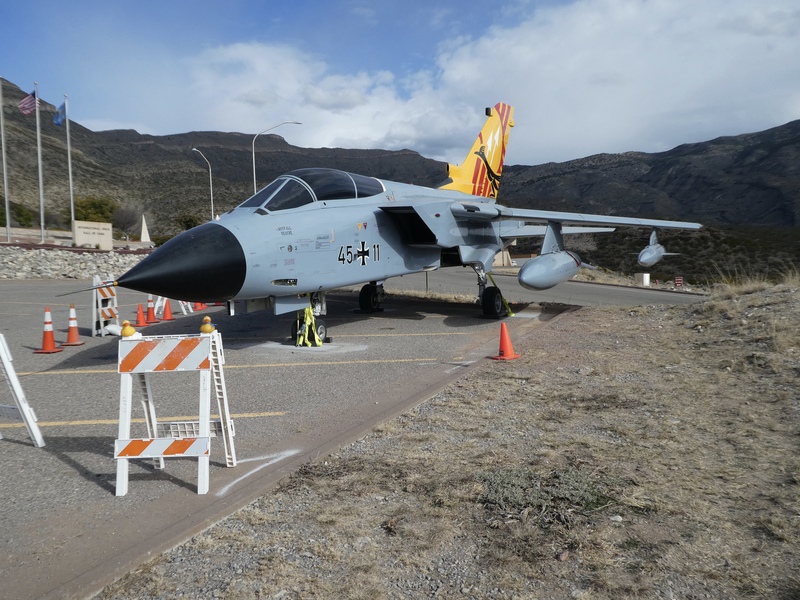 These planes were at nearby Holloman Air Force Base from July 2, 1999 through June 10, 2009. One of its primary missions was precision strikes against ground targets. This plane is highly serviceable due to its automatic terrain-following and electronic counter-measure systems. That’s what the sign said. We followed the sign to the Gravesite of HAM. HAM, world’s first AstroChimp. Final resting place. HAM was the world’s first Astrochimp. He was the first chimp to visit outer space, on Jan 3, 1961. He completed all his tasks on his mission. He flew at 5800 mph, reaching an altitude of 155 miles. During is 16 minute mission he experienced 7 minutes of weightlessness. 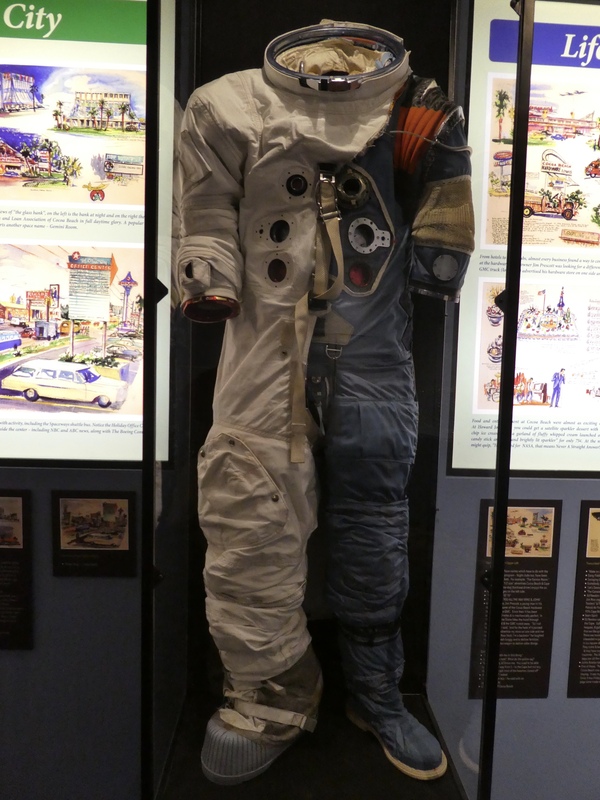 Inside the museum, we saw his space suit. Actually called a restraint suit. Also, we saw the Mercury Primate Capsule. This was his protection while he was strapped in for his flight. After his flight, HAM lived at National Zoo in Washington, DC until 1979. Then he moved to North Carolina Zoo in Asheboro, NC until he died January 19, 1983. His remains were brought here to New Mexico. We don’t usually do this, but I want to show you a photo from Grand Bahama Island from mom’s visit in 2011. That was before I, Zeb the Duck, was even born. 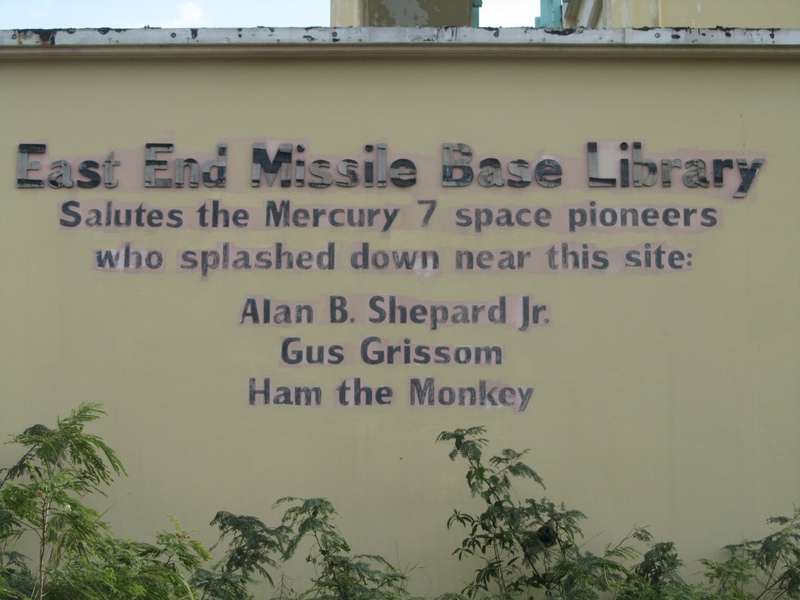 On Grand Bahama Island, SE of Florida, the East End Missile Base Library salutes the Mercury 7 Space Pioneers. The splash down area for early US space flights was very close to this location. 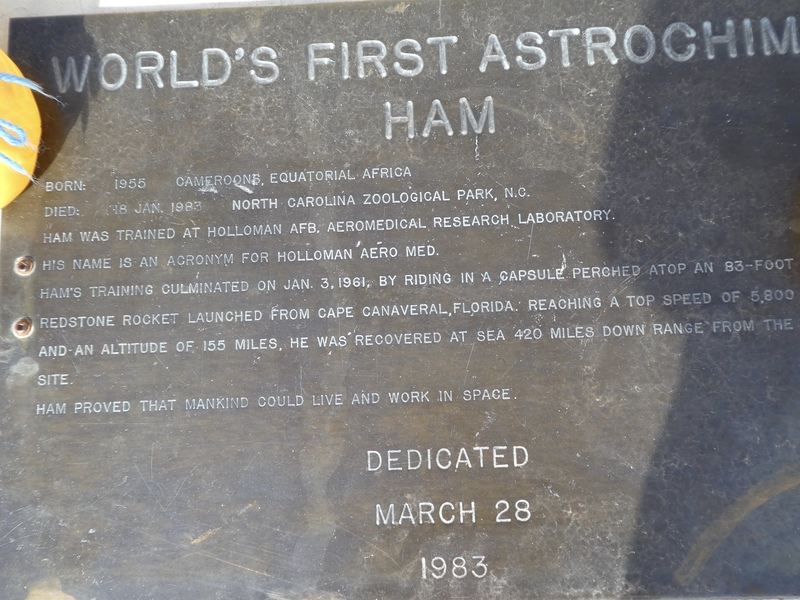 HAM was the first in space January 3, 1961. 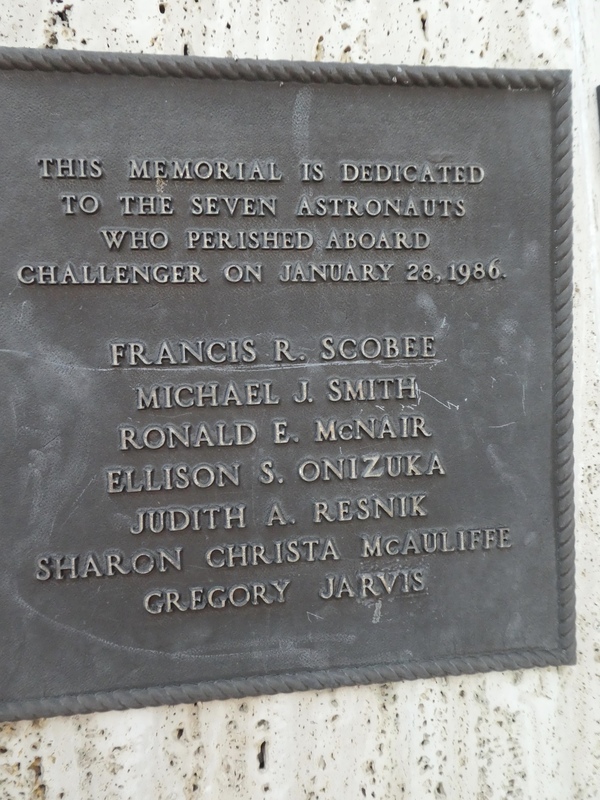 Alan B. Shepard, Jr. was the second on May 5, 1961. Shepard was the first American human in space. Later, in 1971, he also walked on the moon. 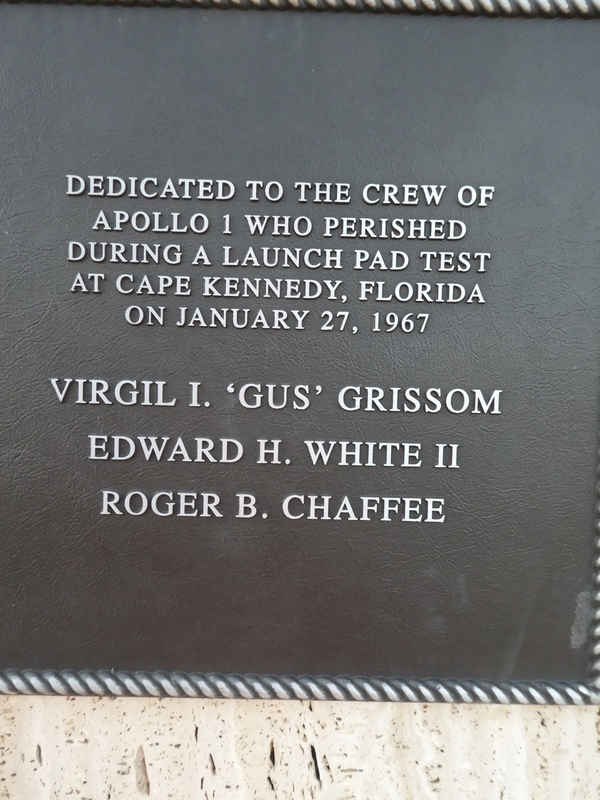 Gus Grissom was the second American human in space, flying July 21, 1961. All flew separately, and all were successful. There was so much to see outside the museum. 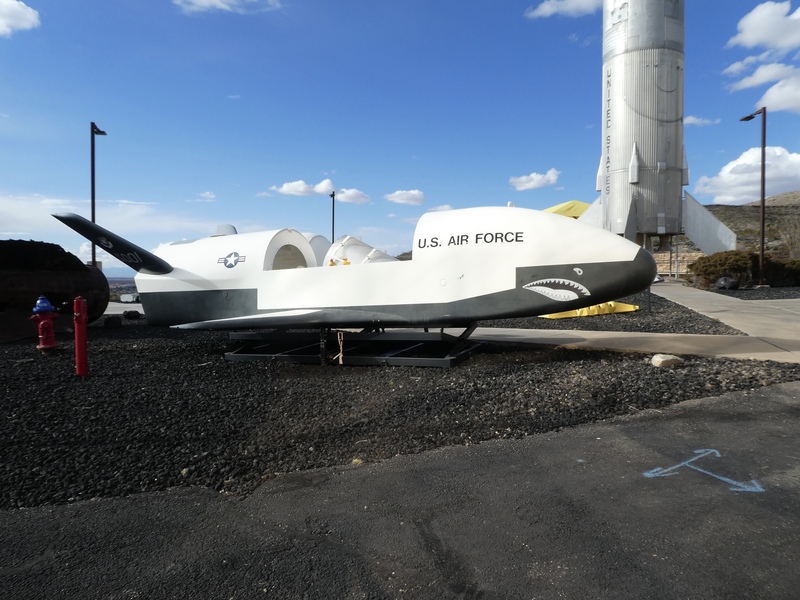 This is a X-7A Test Vehicle. It was used to develop a ramjet engine for anti-aircraft missiles. As a test vehicle it was meant to be reused, so it was covered by parachute. Also we saw this Air Force Plane. 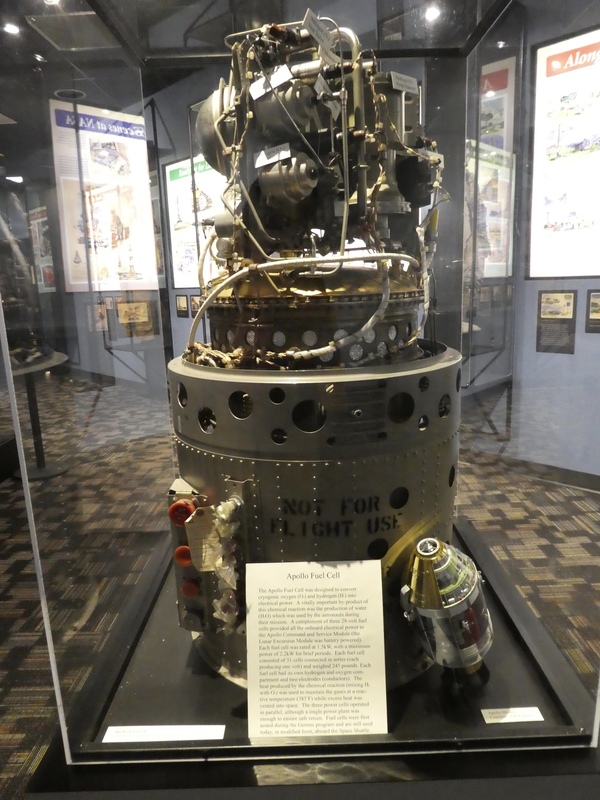 And a capsule used in the space program. Inside the museum, there were many exhibits and many hands on activities. We will just show you a few things. Moon Rocks. These moon rocks were brought back by Apollo 17 astronaut, Harrison Schmitt in December 1972. These rocks are believed to be 3.7 billion years old. If you were alive in 1969, you probably saw this on TV. 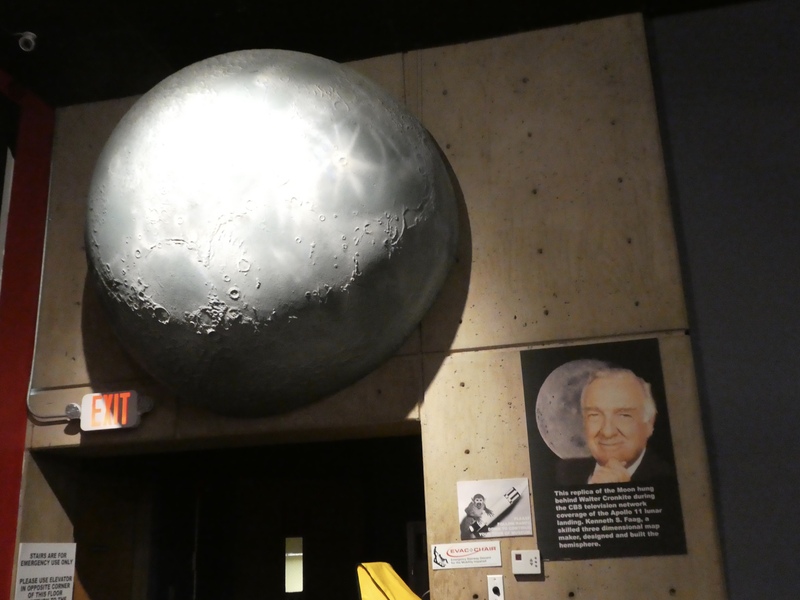 This is the replica of the moon hung behind Walter Cronkite during the CBS TV coverage of the Apollo 11 lunar landing. On July 20, 1969 Neil Armstrong landed Apollo lunar module Eagle on the moon. This was the first ever moon landing. July 21, 1969 Neil Armstrong became the first human to walk on the moon. Buzz Aldrin joined him on the moon. They walked on the moon for about 2 hours and 15 minutes that day. They gathered rocks and sent many pictures back to earth. 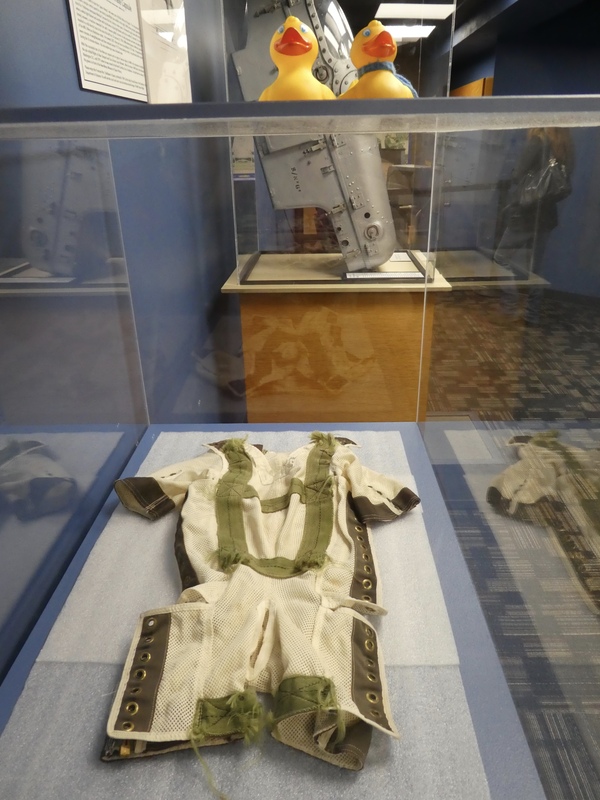 Here is an early space suit. Those suits look bulky and very uncomfortable. 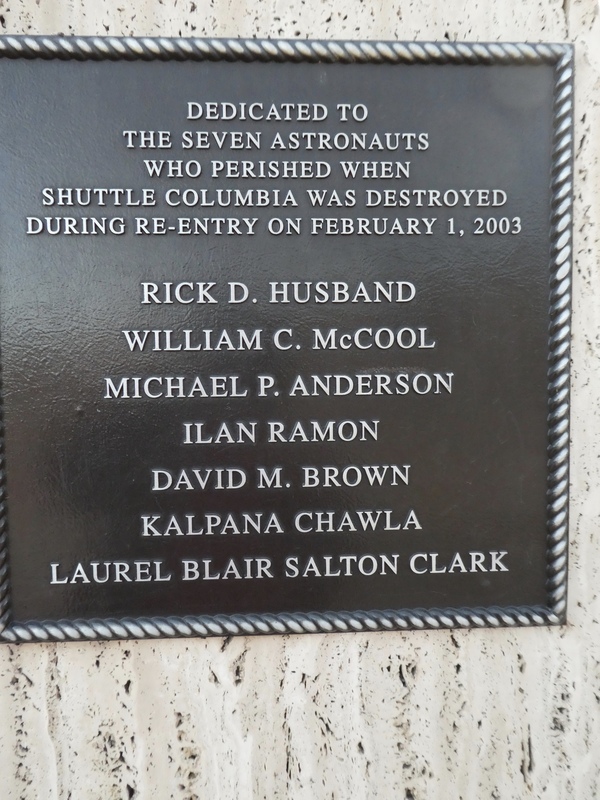 But they did protect the astronauts. The suits are getting more streamlines, as you can see here. Old suit on one leg, newer suit on other leg. 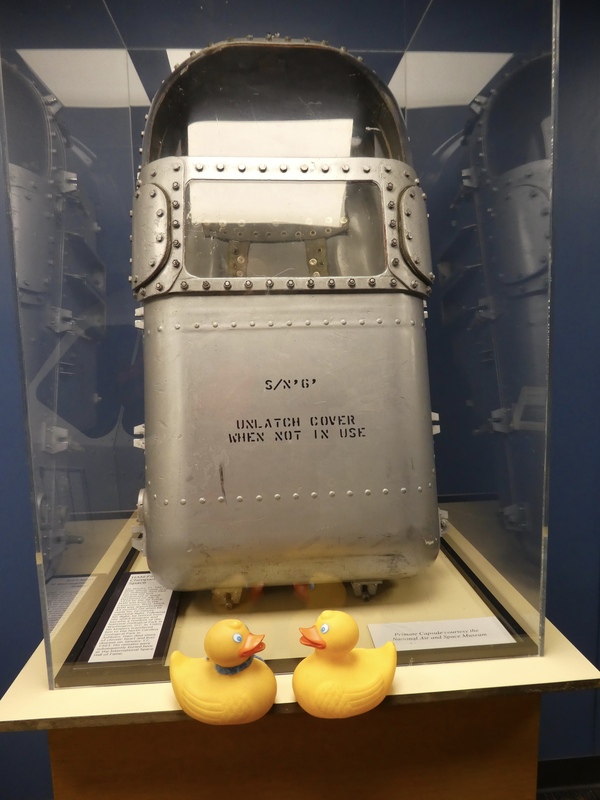 This is an Apollo fuel cell. 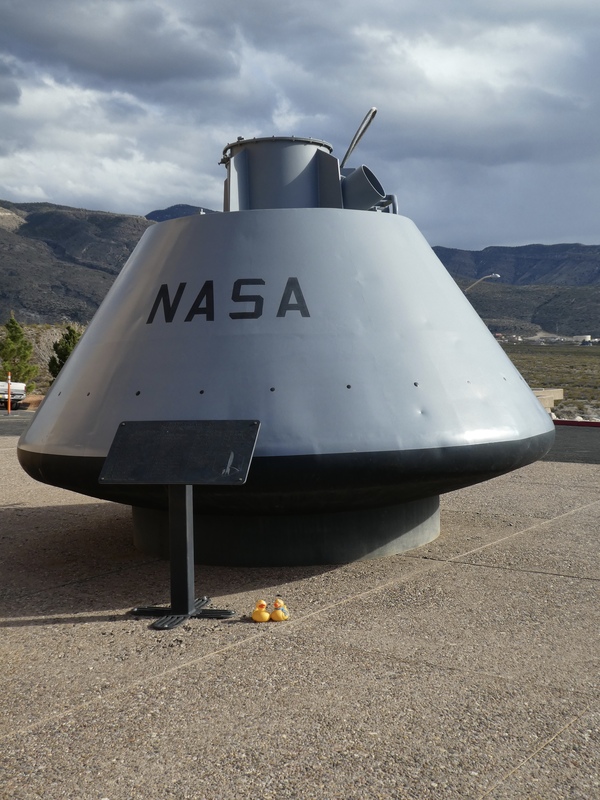 We ducks don’t really understand everything about this space stuff, but we enjoyed seeing everything. Back outside (we had to leave because the museum was closing for the day), we visited this memorial. The United States has suffered three deadly accidents in the space program. 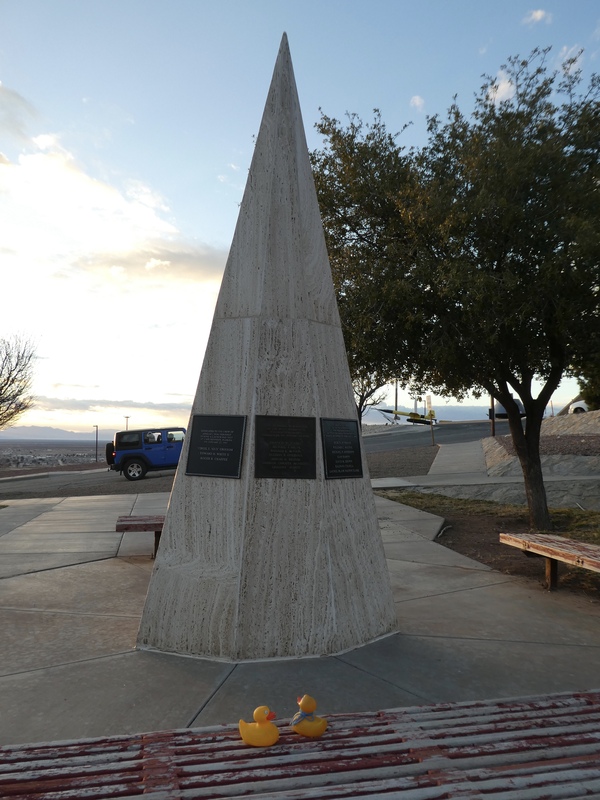 This monument is a memorial to those that perished. Each disaster has a plaque. 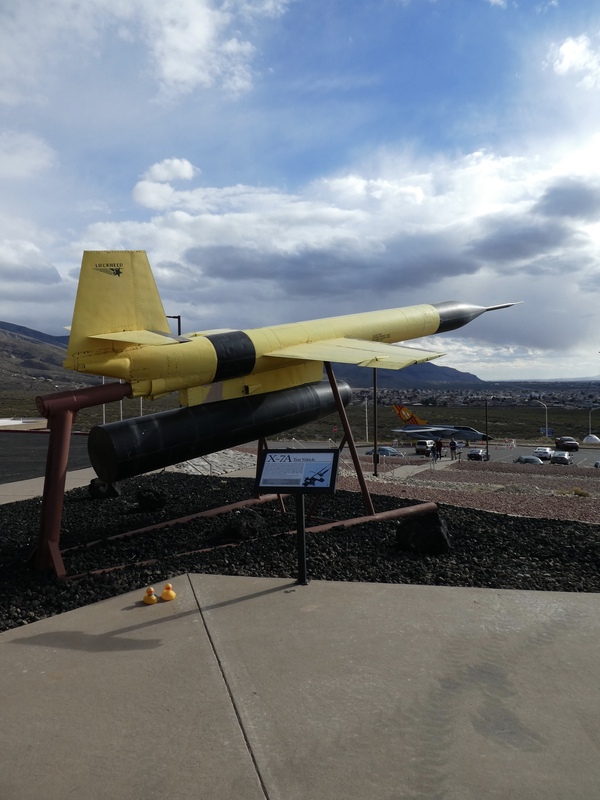 We hope you will visit the New Mexico Museum of Space History in Alamogordo, New Mexico. We found it interesting and believe you will also.